Does age determine the quality of a whisky? 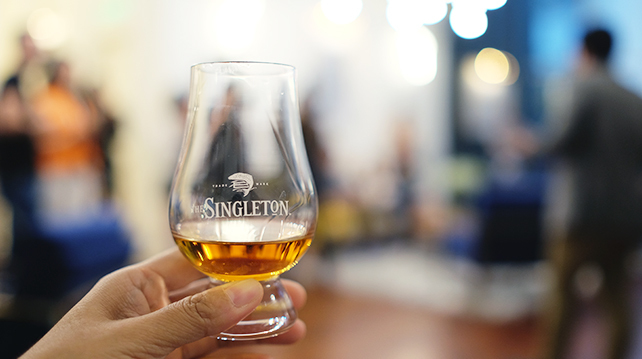 On a Friday evening after work, the lounge area of Colony KL Co-Working Space was turned into a tasting area for The Singleton of Glen Ord to celebrate great Scotch. The gathering brought together entrepreneurs and start-ups from various industries for a session of tasting the single malt whiskies and networking via sharing experiences of their work. 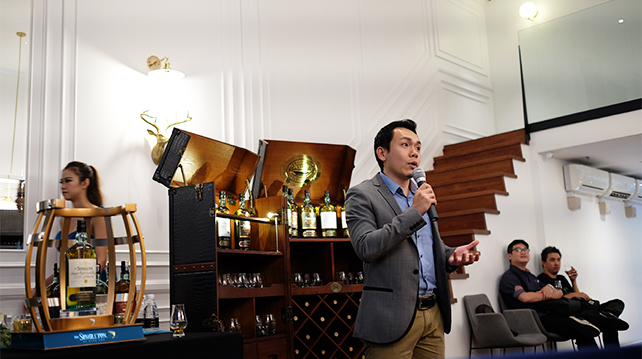 Brand Consultant Ben Ng guided the audience through a step-by-step method to maximise the experience and enjoyment of whisky and spirits tasting. The audience was shown and asked to repeat the steps to enjoy the Scotch in a Glencairn nosing glass. Use a nosing glass, fill it with 30ml of Scotch. Swing the glass from side to side to allow the liquid to “breathe”. Take small whiffs slightly away from the nose of the glass. Try it with your left nostril and then right, or vice versa, to get a balance of the scent. Take a small sip to whet your lips and coat your mouth. Take a bigger sip next and let the spirit sit in your mouth for a few seconds. Don’t gulp. Swirl the liquid in your mouth and pick up the taste as the spirit spreads across your mouth. Repeat and name the taste closest to your taste memory. *It is called a “rough guide” because not everyone enjoys their whisky this way, but if you do, I assure you this is one way closer to knowing your whisky. To highlight the difference between Aged and Non-Aged Statement (NAS), the evening session featured The 12 Year Old, Signature and Signature Sherry Cask of Malaysia’s highest-selling single malt whisky brand. Debunking the myth that whiskies taste better with higher age, it is instead how well it is aged, this factor being influenced by the process from the quality of the base spirits to the wood it is being aged in. Matured for a minimum of 12 years, possesses a fruity taste, which is both light and smooth without compromising any depth of flavour or fullness of palate. Taste of initial pepper notes, followed by sweet cooked apples and rich dried fruits, making it the Master of Malts signature expression of The Singleton of Glen Ord. Matured in sherry casks, giving it an amber colour and flavours of plum and caramel with a long finish of dark chocolate, perfect for those who seek a rich and fruity side to their whisky.